When alchemist Sydney is ordered into hiding to protect the life of Moroi princess Jill Dragomir, the last place she expects to be sent is a human private school in Palm Springs, California. But at their new school, the drama is only just beginning. Populated with new faces as well as familiar ones, Bloodlines explores all the friendship, romance, battles and betrayals that made the #1 “New York Times” bestselling Vampire Academy series so addictive – this time in a part-vampire, part-human setting where the stakes are even higher and everyone’s out for blood. I haven’t yet read the Vampire Academy series although they are on my TBR list. 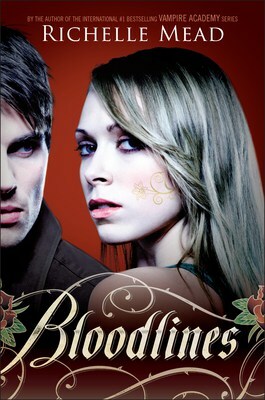 I knew Bloodlines was a spin off of the series, but I figured I would be ok since it was the first book of the series. Unfortunately, that was not the case. I was lost from the beginning. The book starts out with Sydney trying to protect her sister from having to jump into the world of Alchemy and protect a vampire from the Royal family. The alchemists were referring back to something Sydney had done in the past with a vampire named Rose that they weren’t pleased with. Since I hadn’t read the book, I had no clue what they were talking about and I wish the back story had been explained. It never really was throughout the entire book. The story continued on with Sydney going uncover at a private school to protect the teenage vampire, Jill from harm. Both posed as sisters as well as a “brother”, Eddie, who was a dhampir (half human, half vampire). I was fine for the scenes at the school because these characters were introduced so I understood who they all were. I enjoyed the scenes with the school mean girl, Laurel, especially when Sydney took her revenge on her for her treatment of Jill! The parts I was foggy on were when Sydney goes to meet up with the local vampires, Adrian and Clarence. I knew there was back story because they were referring to the past but not really explaining anything. The chemistry between Adrian and Sydney really didn’t mean much to me because I didn’t know their background or anything really about Adrian. I’m sure I would have liked that aspect of the story much more had I read the Vampire Academy books. The book seemed to pick up the pace towards the end and it was action packed for the last 100 pages. Up until that point though it was a slow read for me. Having read Bloodlines though, I am intrigued enough to read the Vampire Academy series. I’d like to experience everything from the beginning and then maybe give Bloodlines another try once I know the background. With that said, I recommend you have read the Vampire Academy first before you pick up a copy of Bloodlines. Connect with Bloodlines on Facebook and Twitter. Read the first chapter of Bloodlines! Check out the Bloodlines trailer!